It's hard to stand out as a $150 printer. Many, many models crowd this affordable price range. Brother pulls off quite a feat, therefore, with the $150 MFC-J870DW. It beats out every other competitor by being the first to offer near-field communication (NFC) as a standard feature. It also crams this product with nearly everything else you could possibly want in a consumer printer. Even better, the printer has reasonably priced inks and a two-year warranty. Checking features off a list is just half the race, though. Performance counts, too. And there, the MFC-J870DW is just an also-ran. NFC is a common feature in smartphones and tablets. You've likely seen commercials where people touch devices together to exchange a photo, or you've heard of handling payments by touching your phone to something. Frankly there's not much more to NFC at this point, but Brother's got the right idea in using it to ease printing from mobile devices. You don't even need to touch your device to the printer--you can be several feet away (see video). You do, however, need to download Brother's free iPrint & Scan app (available for iOS, Android, and Windows Phone), and the printer and the device must be on the same wireless network. Other mobile-printing options include Apple AirPrint for iOS devices, Google Cloud Print, and Cortado's workplace solution for iOS, Android, and BlackBerry devices. 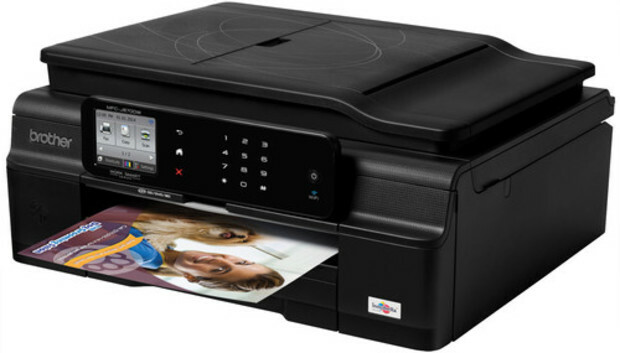 In addition to NFC, this printer also boasts CD/DVD printing from a front-loading tray, ethernet and Wi-Fi (802.11b/g/n, not 802.11ac) connectivity, and a 20-sheet photo tray as well as a 100-sheet letter/legal input tray. The control panel has a 2.7-inch diagonal touchscreen, plus a touch-sensitive control panel whose buttons light only when they're needed. The major limitation to the design is in the handling of two-sided documents. You can print in duplex, and you can turn a one-sided document into a two-sided copy. You cannot, however, scan duplex documents; the automatic feeder just can't do it. If you have a two-sided document to copy or scan, you must scan each side manually on the letter/A4-size platen. This is an incredibly tedious task. Given all the other features in the MFC-J870DW I might seem petty to complain, but I think this limitation is going to effect everyday use more than the presence of CD/DVD printing or NFC. Everyday performance matters, too, and in this respect, the MFC-J870DW is acceptable. On the PC platform, it printed pages with mostly plain text and a few monochrome graphics at a speed of 7.9 pages per minute (ppm). Our color-photo sample, a snapshot-sized photo on letter-size paper, took just 20 seconds (3 ppm) to print at default settings onto plain paper. When we switched to photo paper and the Best-quality setting, however, it took more than five times as long--111 seconds--to print the same image. Copy speed for a plain-text document was slow (3.2 ppm). On the Mac platform, text printed faster--9.6 ppm--while a four-page PDF file printed at a sedate 1.6 ppm, and a full-page, high-resolution photo printed at typical 0.5 ppm. Scan speeds were faster than average. Output quality was also acceptable. Plain text was more dark-charcoal than true black, and it was just slightly fuzzy around the edges--in other words, stereotypical inkjet quality. Color images printed on plain paper looked yellow and dotty. Switching to photo paper eliminated all flaws except for a persistent yellowish cast. Scans of line art and black text were very nice, but harsh shadows marred color scans. Brother's prices for replacement ink cartridges for the MFC-J870DW are a little better than average--and that's not guaranteed in this price range. The 300-page, standard-size cartridges include a $15 black (5 cents per page) and $10 cyan, magenta, and yellow (3.3 cents per color per page). The 600-page, high-yield cartridges are a $25 black (4.2 cents per page) and $15 cyan, magenta, and yellow (2.5 cents per color per page). A page with all four colors would cost a slightly cheaper than average 15 cents with the standard-size cartridges, and an economical 11.7 cents with the high-yield cartridges. The Brother MFC-J870DW deserves credit for being progressive, adding NFC ahead of its competition--and arguably, ahead of customer readiness. The printer's actual performance remains unremarkable, however, so you have to decide whether you want more features or better quality. The HP Officejet 6700 Premium offers better performance, if not quite every bell and whistle.